A patrol discovers a hospitable planet that just may be Kobol, the lost homeworld of humanity. This episode opens 50 days after the annihilation of the Twelve Colonies. It seems to be the same day as the one at the end of "Colonial Day", as Starbuck is seen slipping into the same blue dress she wore then after her tryst with Baltar here. The title of this episode is inspired by the line "twilight's last gleaming" in the national anthem of the United States, "The Star-Spangled Banner". A scene was cut from this episode in which Chief Tyrol arranges for the release of Specialist Socinus from the brig due to the need for experienced help on the flight deck. This is why Socinus is a member of the crew of Raptor 1 for the ground study of Kobol. The "previously on Battlestar Galactica" sequence at the beginning of the episode has a snippet from a scene that was actually cut from the aired episode of "Flesh and Bone". It tells that a Cylon device identical to the one found mounted in a hidden spot in CIC in "Flight" was found in the possession of the "Leoben model" Cylon captured by fleet security here. In this episode, it's revealed that study by fleet scientists has determined the devices are transponders that essentially tell Cylons that happen to be near the fleet in space "here I am". At 1:55 on the Blu-ray, in the scene of Starbuck making love to a man, the profile shows us that the man is Apollo. This is Starbuck's imagination of who she's making love with...we find out shortly the man is actually Baltar. The pistol Boomer tries to kill herself with is a Vektor CP1, a real world pistol. At 5:11 on the Blu-ray, a locker labeled as Duke's can be seen in the background in the gym. We never meet a character by that name in the series. During her meeting with Vice President Baltar, President Roslin implies that a barter economy is currently prevalent throughout the fleet. Her administration is making moves towards re-establishing a currency-based standard. At 12:15 on the Blu-ray, the President's white board shows 47,897 people in the fleet, down one from "Colonial Day", presumably due to the death of Valance in that episode. At 13:21 on the Blu-ray, notice there is a "Please return to your seat" sign in the Colonial One restroom, just as sometimes seen on airliners. 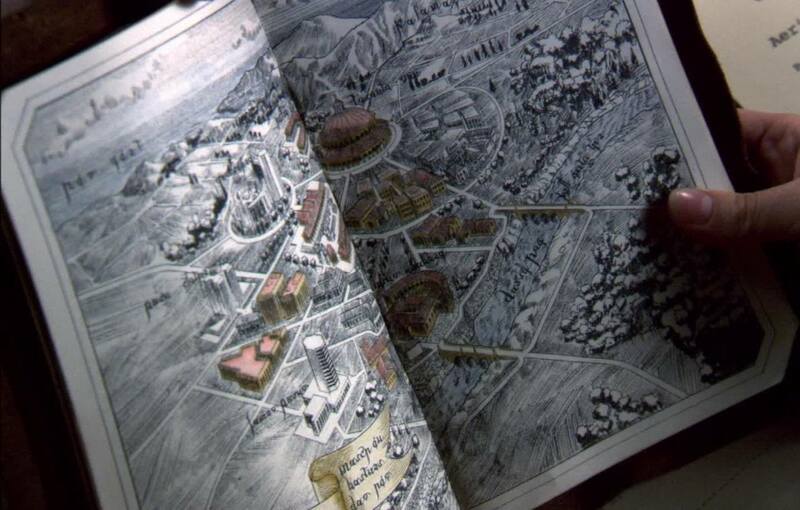 Roslin mentions that there is a forum on Caprica similar to the ruins they find on Kobol. Elosha states that it was about 2000 years ago that the 13 tribes left Kobol. At 21:22 on the Blu-ray, Elosha shows Roslin a drawing in a book of the original forum in the City of the Gods on Kobol. Notice there is strange writing on the pages as well, presumably in the Kobolian language. Elosha states that the gods and men lived in paradise on Kobol until the exodus of the 13 tribes. Does she mean the gods lived amongst the humans (or the humans amongst the gods) at the same time? And what makes the gods "gods"? Lt. Gaeta states that the Cylon transponder devices found on Galactica and in Fleet-Leoben's possession send off a short I.F.F. burst when they are in proximity of each other. I.F.F. generally means "Identification Friend or Foe". Apparently, either two Cylon transponder devices were found within the fleet (besides the one found on Galactica in "Flight"), or Fleet-Leoben had two in his belongings (in "Colonial Day"), as three such devices are shown at 33:12 on the Blu-ray. President Roslin tells Starbuck that she is dying and has only told three other people. But, we know that at least four other people know of her cancer: Billy, Dr. Cottle, Apollo, and Elosha. When Commander Adama realizes Starbuck is about to do something unauthorized because she's disappointed in him for lying about Earth, he asks her what she is doing and she responds, "Bringing home the cat, sir." This goes back to the military cadence she and Adama like to recite back to each other, as established in previous episodes. According to Crashdown in a deleted scene, Karma is considered to be a bad luck pilot. Why did the 13 Tribes leave Kobol? This is eventually answered in "No Exit": a war between the 12 human tribes and Cylons, the 13th tribe. This harkens back to the "all this has happened before and will happen again" religious refrain of the Kobollian religion.